We are super excited to be launching a number of new products and ideas this year. We are also on the look out to back some good causes for wildlife preservation so if you know of anyone who would be interested in working with us please get in touch. We are currently putting together free Bee friendly packages for good causes who we feel could benefit from planting wildflowers to encourage our humble bumbles and other wildlife. These will be available soon so please watch this space or sign up for our newsletter which will give you a weekly buzz on all that is new. We are also in the process of re-designing some of our packaging and products for Christmas as we see a return of our much loved Advent calendar and a totally new re-vamped super sized 2019 seed calendar! Not to mention that we are super excited that some of our cards will be flying their way to the Chelsea flower show this month! Love is in the air as wedding season gets underway! Here at Seedlings we have been busy re-vamping our wildflower seed ranges and this now includes totally customisable wildflower seed packet favours! Available in three different designs - Love Bugs, Wedding Cake or Floral Heart (or you can contact us to design one of your own) All text can be personalised to add that extra special touch. Available over on our Notonthehighstreet store. We had some great press coverage at the end of 2016 with our yearly seed calendars taking centre stage! It was fantastic to find this full page feature in December's Garden answers although by the time it was published we had already sold out of our most popular product, so many apologies for those of you who missed out. Every year we produce more than the year previous but each year demand seems to surpass our greatest expectations. The calendars become available around August so keep an eye out to avoid disappointment! We were also notified by customers of a feature in Homes & Gardens magazine but we unfortunately couldn't get hold of the issue- so if anyone out there has it we would massively appreciate a pic! And in other news... we are having a bit of a relaxed start to the year as we eagerly await the arrival of our son who is due any day now! We are also taking this time to re-vamp some products and bring you some new additions for spring including a lovely new wedding range, which we hope you all enjoy! Any questions regarding our wholesale products and access to our trade site please send us a message on- seedlingscards@gmail.com as this will be having some downtime whilst we get our new products ready for launch. A host of Cornfield annuals- Cornflower, meadow buttercup, oxeye Daisy and more make up our wildflower mixes. Our plantable gifts and cards use wildflower varieties and mixes that have been grown and harvested in the U.k and we pride ourselves on using (in our opinion) one of the best seed suppliers in the U.k which has been working with wildseed for over 30 years. Not only are they expert growers they are also ecologists that promote and educate on the positive effects of growing wild flowers for now and the future. Wildflowers are both beautiful and beneficial, and to so many of our wild friends, they are a life source. The decline of the Bumblebee has had a high profile presence recently with effort being made to increase awareness of planting wildflowers that provide them with food and shelter. Changes in agricultural techniques have meant that there are far fewer wildflowers in the landscape than there used to be, meaning that many of our bumblebee species are struggling to survive. Bumblebees drink nectar and eat pollen- nothing else, so they rely solely upon nectar-rich wildflowers for survival. If the plight of the humble Bumblebee is not enough to get you digging out your own small meadow plot, then how about a whole host of Butterfly beauties? Wildflowers will also attract Small Coppers, Common Blues, Marbled whites, Meadow Browns and small Skippers, amongst other creatures. Like all plants, wild flower seeds should be treated with care and caution. Keep in a cool, dry and preferably dark place until ready to sow. Some varieties may need periods of chilling to break dormancy but sowing directly into the plot will allow nature to do its trick. If you would like any further information about growing our seeds please get in touch and we will be happy to help. Our beautiful 2017 Seed calendars have arrived! 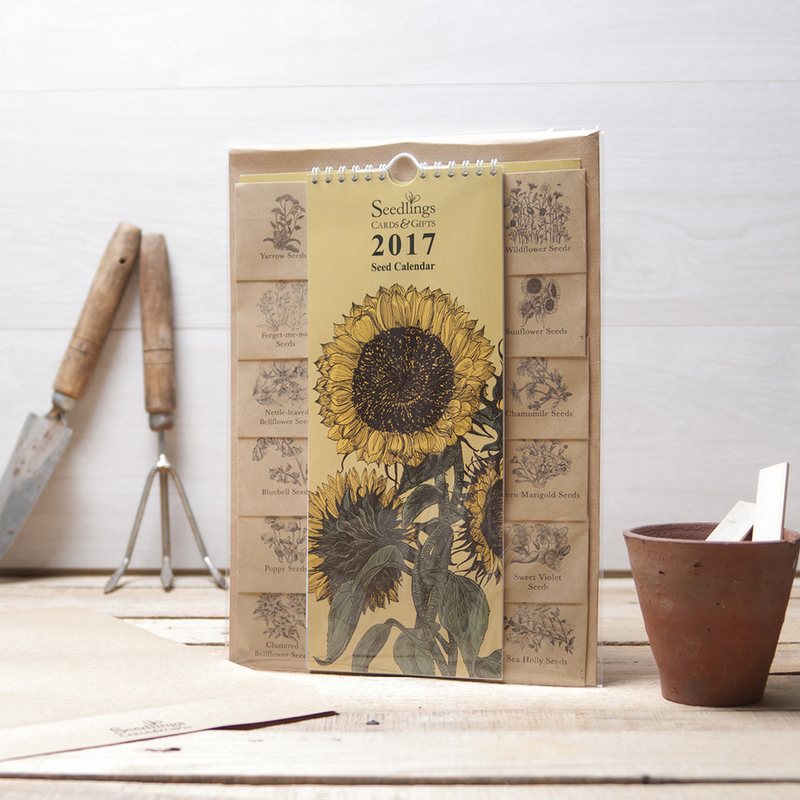 For 2017 we have given this gardening favourite a re-vamp with brand new botanical style florals and new seed varieties. Along with the new design you'll also find further growing instructions for your seeds on the back page and gardening tips each month. As our thoughts turn towards Easter we are very happy to launch our beautiful Hare & Twine design fabric! Available by the metre or as beautiful tea towels, our fabric is a natural un-bleached cotton and Linen blend made in the U.k, which brings an element of rustic charm to any space. As we prepare for our Spring Show at the NEC in just over a weeks time, I take a moment to appreciate our beautiful new surroundings. Seedlings took up residency in the historic Cotswold village of Broadway last November and has been enjoying village life ever since. Broadway itself is a beautiful Historic Village with a gathering of ancient honey coloured limestone buildings which dwell at the base of the Worcestershire hills in an area of outstanding natural beauty. It is therefore, no surprise that such a place has long drawn the attention of artists and designers worldwide who have fell for its picturesque charm. John Singer Sargent and Francis Millet being amongst them, as well as the design pioneer Gordon Russell who once based his factory there. The Gorden Russel museum is now sited here and for anyone with an interest in 90th century furniture design a visit is a must. The cotswold area itself became an important centre for the Arts and Crafts Movement in the early 20th century and Arts and crafts visitor trails are available through neighbouring towns Chipping Campden with its rich legacy of work by the Arts and Crafts architect CR Ashbee, to the Country home of William Morris at Kelmscott Manor. The Arts and Crafts movement was an English aesthetic movement of the second half of the 19th century that represented the beginning of a new appreciation of the decorative arts. It was one of the most influential, profound and far reaching design movements of modern times that quickly spread across America and Europe before emerging finally as the Mingei (Folk Crafts) movement in Japan. Here at Seedlings we draw heavily upon the ideologies of this time and take inspiration from it's leading members such as William Morris, who felt that the 'diligent study of nature' was extremely important. He viewed the study of nature as the spiritual antidote to the decline in social, moral and artistic standards he witnessed around him during the industrial revolution and helped to revive a love of handcrafted, beautifully designed, pieces of art. The movement advocated the reform of art at every level and across a broad social spectrum, turning the home into a work of art. Some of William Morris' original wallpaper and textile designs can be viewed here and find out more about the Arts and crafts movement here at the V&A museum. We've just received our sample shots back from the Manchester based ForeverCreative Photography and we are delighted with them! Here is one of our favourites showing our 2016 seed calendar. Now we can't wait to do the full shoot in October!